Color - Navy Blue. 6 3/4" Inseam. Inseam 6 3/4" Across Hem 12". 100% Cotton. Stretchy Twill Costruction. cotton, spandex. FIT & SIZING. The product should be in original condition. Midrise sits above the hip. These have a scalloped edge. SIZE: 14 / 3" INSEAM. 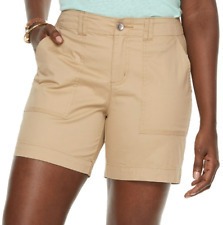 You will LOVE these shorts. 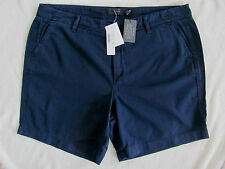 NEW WOMENS TOMMY HILFIGER TOMMY CLASSIC BERMUDA SHORTS! CHINO SHORTS! VARIETY! Inseam: 5”. Material(s): 100% Cotton. Across Waistband: 20”. Across Pant Hem Opening: 14”. Navy and white striped print with red hearts. This item may have been washed and dried, may fit different than new, and may have a few small missed flaws. In good preowned condition. Rise is 11”. Made of 100% cotton. Mid Rise, Zip Fly. Hits mid thigh. Cut-off hem. More To Love MTL Size 16 Women's Plaid Pink Black Shorts. Condition is Pre-owned. They button and zip, cuffed bottom and pockets on back. Inseam: 3”. Across Pant Hem Opening: 14”. Material(s): 100% Cotton. Front Rise: 10”. Color - Khaki. Mid Rise, Zip Fly. 5" Inseam. 97% Cotton, 3% Spandex. Stretch fabric for a comfortable fit.